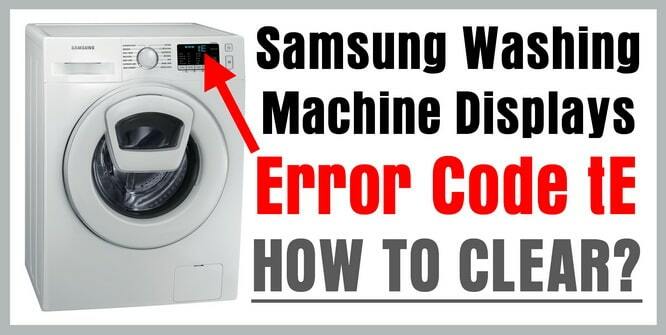 Is your Samsung washing machine showing the error code tE? If your Samsung washer is running a wash cycle and the tE error code shows on your washers display, it means that you have a faulty Temperature Sensor, also known as a Thermistor. The Thermistor is a small part in the back of the washer that reads the temperature of the water during a cycle. There are a few things that may or can occur that will cause your washer to display the tE or tE1 fault code. Samsung washer displays tE error code. This indicates a malfunctioning temperature sensor (thermistor). 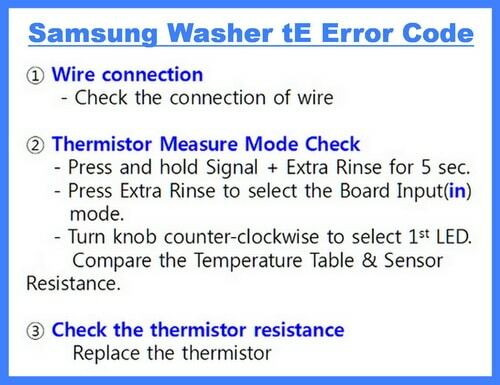 The Samsung washing machine tE or tE1 error indicates the water temp is too low or too high. 1 – Unplug the washing machine for 10 minutes. 2 – After 10 minutes, plug the washer back in. 3 – The washing machine’s main control board may have reset. 4 – Test the washing machine by running a small load. 5 – If the tE error code is now clear, resetting the control board has fixed the problem. 1 – Check the wiring on the Thermistor itself. 2 – Check the wires that connect to the Thermistor to be sure they are not loose or broken. 3 – Check the wiring going from the Thermistor to the control board. 4 – Be sure the wires have continuity and the wiring harness is not damaged. 5 – If the wiring harness is found to be damaged, replace the wire harness and test washer. – Use DIAGNOSTICS MODE to find out if the Thermistor is faulty. – You will need to put your Samsung washer into DIAGNOSTICS MODE. – This will need to be done to determine what water temp the control board measures. – If the temperature reading is not the same, then you will know the Thermistor is OUT OF RANGE which means the Thermistor needs to be removed and replaced. In Diagnostic Mode, you can check what error codes have occurred using diagnostic mode. When you enter into diagnostic mode the letter “d” is displayed. Turn or jog the dial in a clockwise or counter clockwise motion and you can see which error codes that have recently happened. – Press and hold Signal + Extra Rinse for 5 sec. – Press Extra Rinse to select the Board Input (in) mode. – Turn knob counter-clockwise to select 1st LED. – Compare the Temperature Table below to the Sensor Resistance. You will need to unplug the washer before replacing the Thermistor. The Thermistor is attached to the bottom back of the washer drum. The Thermistor is attached with 2 screws. Remove the screws and the Thermistor will slip out. Replace the new Thermistor by attaching the wire connectors and slipping the new Thermistor into place. Secure it with the 2 screws. Put the washer back together and test washer. The Samsung washer tE error code will now be gone and the washer should have no problems. Do you have a Samsung washer that displays tE or tE1 on the display? Please let us know if you have comments or questions and we will be happy to assist. having the same issue right now I really can’t complain though as the machine has lasted 5 years which is a record for me. I am the death dealer for washing machines. I *will* buy another one soon. The 5 years parts and labour warranty means I will have the new one working for at least another 5 years, then if this one can be repaired, I will keep it to wash the dog bedding and gritty rugs which normally cause the problems and kill washing machines. I’ve gone thru the diag of this several times today. Checked the wires visually and for continuity. Was able to get the code to clear for one complete 20 minute wash cycle put in a load of heavy duty clothes for a long wash cycle and the code came back. The thermistor has been replaced and the code still came back. I just want to wash our dang clothes got a big family where do I go from here? I took the back panel off and looked for washer thermistor and I can’t find it. Could it be that this is a different model than your photo? Is mine somewhere else?